What's my Concorde Colombo worth? Had this inquiry the other day. I have a mid-eighties Concorde Colombo. It a 61cm frame. Complete Campagnolo Aero group with Cinelli bars and post. Black and white frame. Excellent condition with a few minor scratches. All original except for saddle. Any chance you could give me an idea of what I should be asking for it? I know a picture would help but how about a ballpark range. Why I would spend time trying to value someone else's bike when I am trying to sell my own, I don't know. especially when this person didn't even bother to include pictures. But the challenge of the exercise got to me. what is distinctive on the frame? is there a tricolour patch on the toptube? No tricolour patch but the lugs have hearts cut into them that are painted. At first I was annoyed that he hadn't even bothered to provide pictures. But after thinking about it, I realized that pictures are irrelevant (unless one were assessing condition or paint scheme). A bike can be well described and assessed just in words. If you are super patient, you might find a taker at $1000. Might. but realistically, I think you are being optimistic. The Tommasini has several advantages: Columbus SL tubing (recognized as Top End), matching forks, 8 Speed Athena Ergo (click) drivetrain (which bumps it immediately into the not-just-collectors-and-vintage-wingnuts market), triple crank (which makes it a Climber) and is a Top 10 or Top 20 brand from Italy, which would be mentioned in the same breath as Colnago, Pinarello, Rossin, De Rosa etc. I think realistically it will move in the $500-700 range. The frame would make a decent fixie/Single Speed. you'd probably make more parting it out. but that's a pain. From Classic Rendezvous: “A brand from the Netherlands who used many suppliers. PRO: Not their best but It's still Columbus! Uncertain whether it is Tre-Tubi (main triangle only) or Frame and Forks. Is there a columbus sticker on the fork blades? Does it say Tre-Tubi on the seat tube sticker. CONS: But downtube shifters are really not very prized these days. CON: Would be Campagnolo or Columbus on a top tier frame. Anyone who thinks they can hunt, collect, buy and sell classic bikes and make a profit is probably dreaming. For every winner, you can be sure to have 2, 3 of 4 money losers, unsaleable bikes which seemed like good ideas at the time. 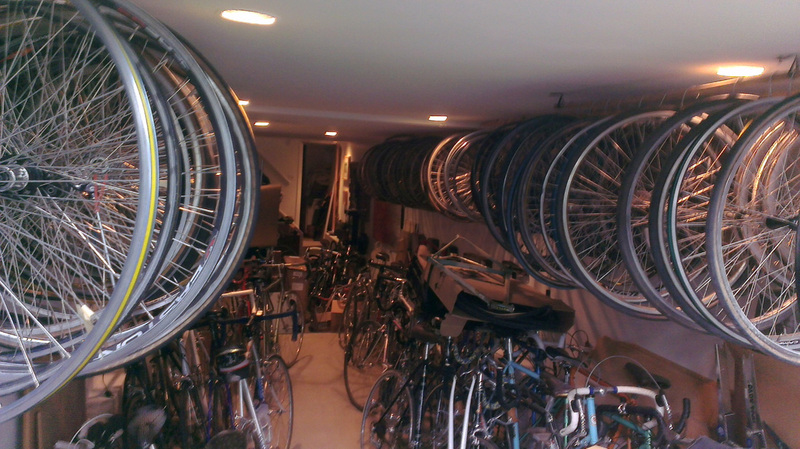 Beyond the cost of mistakes, there's taxes, duty, shipping and storage.Sure, 5 years ago, I thought it would be easier to make 10-20% on each bike. But once I realized this wasn't possible bike after bike, what was left was at least meeting some nice people, who appreciated a nice bike and who would ride it with pride. I have an interest in your 52 cm Tommasini [ed. which is currently listed for $1200]. If you were to keep the saddle, tires/tubes, would you be willing to take 1050 for it? Thanks. this bike though (as I expect you know) is pretty special. The price i have it at now ($1200) is just for winter, while sales are slow. Come Spring I will pop it back up to it's true value, $1400. and it'll go. Seems I must have struck a nerve, as he responded, rather testily. Thanks for your reply. Although I find it ironic and perhaps even arrogant that you use the term "true value" when the basis of your business is buying bikes cheap and then giving them nose-bleed mark-ups. Don't worry, old Italian granny didn't know her Colnago was worth more than a hundred bucks. I do see you like make honesty your selling point, but given your belief that you are all about honesty, it's clear to me from your email that it is just a narcissistic veneer. You talk about honesty and etc. but part of that is not ripping people off. If the "true value" of your bike really was 1400, then why is it still unsold at 1200? You should ask yourself these questions. In the future I think I will stick to a simple "No Thank You" when rejecting a lowball. James dreams....of a Steve Bauer "Boreas"
I've been emailing with a fellow named James for about a year. He's looking for a better quality road bike, but he's on a bit of a budget. Fair enough. James popped back up this week and here was one interesting exchange. James wrote: "Ideally I was looking for an uber clean Canadian bike from say 1989 like: (a Steve Bauer "Boreas" pictured Left) ; in that way the Vitus was stretch, but I liked the lines and the colour. I have noticed small sizes are very hard to find, especially with period correct parts. Most bikes I do come across are either too used up + parts are from all over; or listed for $1800+ because they are museum quality. The $2000-$3000 1980's bikes on eBay and other specialty sites are breath taking but well above my pay grade. " interesting that you zeroed in on a Steve Bauer bike. this is probably the best bike I've seen with Bauer's name on it. He seems to have allowed his name to be slapped on a lot of junky bikes. But even this one, the Boreas model, with a bit of research, appears to have Tange 900 tubing. about which one commentator said: "A Google search on "Tange 900" gave a bunch of hits. Apparently 900 is the second from the bottom of Tange's Cr-Mo butted tubing range so the basic metal is good and the tube set is reasonably light, if not exotically so. It was made from rolled and welded strip, not seamless, but that isn't a real problem as seamed tubing can be very good as the subsequent die drawing makes the seam pretty much disappear." 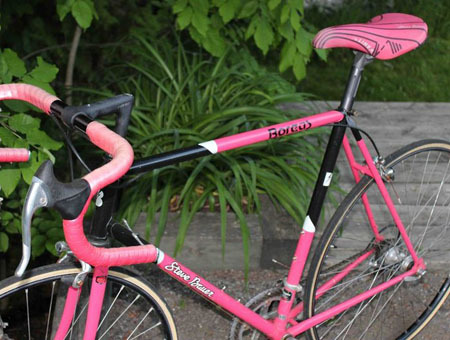 The "Pink Vitus" with Columbus Thron tubing is already, fundamentally, a better bike than the Bauer. and frankly, I would rather live in the cheapest house in an upscale neighbourhood than the most expensive house in a rundown neighbourhood. The Bauer is an example of the later, as though it is probably the best with his name on it, it's still a cheap bike. The Pink Bike is like the "bargain" house on the expensive street - it is at least attached to the prestigious Columbus pedigree. There are only a handful of Canadian framebuilders who I think are worth collecting or riding. Mariposa, Cyclops, True North, certain Marinonis, certain Gardins.. that's about it. there are then some obscure makers (Edwins, Joker) but the odds of seeing one on the market is low. what's your ideal size? a 52? A friend (well, actually the guy who owns Fermentations, the DIY beer and wine making place I frequent) is looking for a bike to replace the one he had stolen. He is thinking aluminum, but I suggested a few steel options. He wrote: "my current "crappy" bike is on a steel frame, it is a pig to get started from a standing stop, but i have used it on long rides and have found it comfortable my theory? is that it is the frame that is making it a pig- but maybe it is the wheels/other components? " Cheap steel bikes are made of straight gauge steel. Basically it's like steel plumbing pipe. Heavy, inelegant. Making the tubes for HQLWS bikes is a high art form. The tubes are made of CRMO steel (a special alloy) and are cold drawn. How the hell they do even that I have no clue. But even more amazing is that HQLWS tubes are also butted, meaning they are thicker at the ends where the frame is joined, that in the middle of the tube. The most famous names in steel bike tubes are: Columbus (Italy) and Reynolds (UK). next would be Tange and Ishiwata (Japan), True Temper (America). Then, each manufacturer makes a range of models. Here for instance is a chart showing most of the Columbus tubesets and their various characteristics. You'll see for instance a set of numbers like 0.5/0.8 at the top of each cell. That's the butting. that tube is 0.8mm thick at the ends, 0.5mm thick in the middle. The most classic steel tubing is either Reynolds 531 or 753 OR columbus SL or SLX. A good bike will have a sticker on the frame showing what the tube materials are. It can be all very confusing. and your basic question was "why does my steel beater feel like a pig?" a complete HQLWS bike should weigh between 9 and 11 kgs, (without pedals, but you can deduct 300-500g if the pedals are on.) More than 11kg, and it'll start to feel like a pig. Way more and it is a pig. But frame weight is only part of it. Geometry and tube characteristics are also crucial to how a bike feels, how it responds. But you are correct too, the other key source of Piggishness is the wheelset. experts always advising investing in a good set of wheels because saving rolling weight is more critical than dead weight like the frame or components. A super lightweight wheels set (the front and back) will total... 1500g. A cheaper wheelset can be 3000g, a really crappy wheelset can probably weight 5000g. When I come over to bottle this week I'll bring my digital scale and send you home with it. as a starting point it is worth weight a) the bike and b) the wheels. And send me a picture of the steel framed bike with some closeups of the rear and front derailleurs, brake calipers, crankarm and wheels. But smart riders who are not racing are riding steel (or titanium) framed bikes. It's like the difference between a pair of hand made leather dress shoes or hiking boots and new age Nikes. Or, a MGB, TR6 or Fiat Spyder versus.. a Boxster or something new. Steel affords comfort, ride pleasure, handmade craftsmanship, economy, resale value, and just bragging rights. How does one amass some 120 loose wheels? It baffles me too. 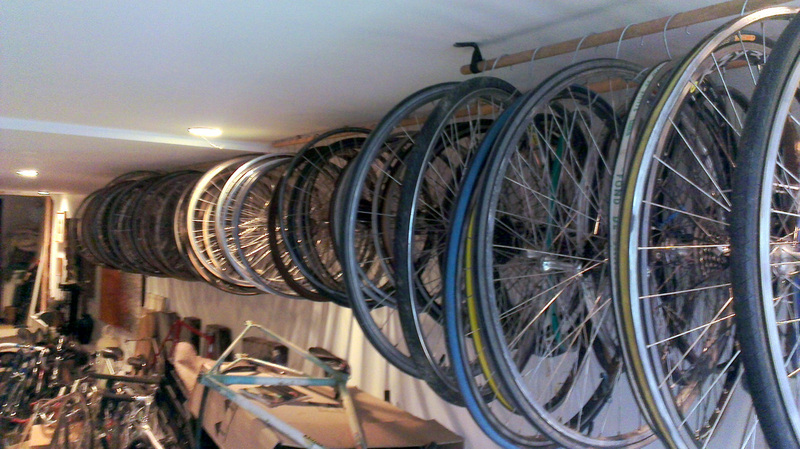 But having just moved and rehung all my wheels, I took the time to catalogue and count them too. 120 wheels! that's about 60 pairs. Lots of interest in Vintage this week. This was the 2nd query from a collector. I was especially interested that he would lump Marinoni (a Canadian brand out of Montreal) with Colnago and Pinarello. And I give my 2cents on that at the tail end. Hi. I may be interested in the tommasini. Is it colombus tubing? And how would you rate this against a pinarello, colnago or a marinoni? Any info on this tommasini is appreciated. Thank you. But good eye to spot the Tommasini. She's a beaut. There is a terrific book "Italian Racing Bicycles" by Guido Rubino. as you can see from the attached (let me know if they are not legible and I will resend), Tommasini is one of the 40 classic Italian brands featured. Tubing here is Columbus SL, probably ranked as The Best Columbus tubing. Considered better than SLX by many aficionados. Marinoni makes some very good bikes, but I would not put them in the same class as Pinarello or Colnago or Tommasini. Put it this way, you see Marinonis locked up on the street to signposts around town. You would never see a Tommasini locked on the street. Too precious. In fact you rarely see a Tommasini anywhere. Colnagos have become so popular, well known and ubiquitous that they are becoming a bit common. Not so Tommasinis. Furthermore, outside of Canada, almost no one has really heard of Marinoni. That doesn't diminish the value of their best stuff. It's just a fact that there is much lower resale and almost zero collector interest. I am looking for an 80s era Colnago frame set that I can build up over time. 60-62cm frame. That frame you have is nice, I would need to strip it and give it a brighter paint job. My budget is definitely less than $500. I'm looking in the 200-300 range. There's quite a leap from Miele to Merckx. They are not usually mentioned in the same search. 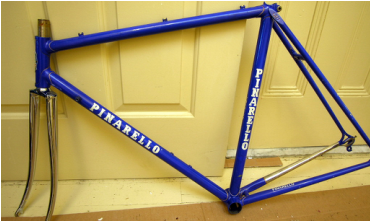 With patience, you might find a decent frame in the $200-300 range, but highly unlikely a top brand like Colnago, Pinarello, Merckx. I think you have to refine your search. I've never heard of Fluer. Who are / were they? By the way, what would you look at that would tell you a frame was high quality or not? 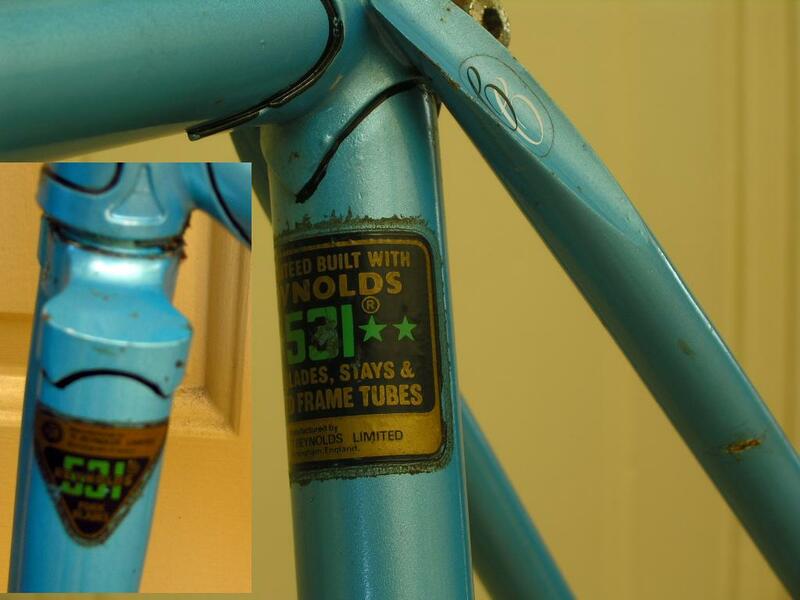 And FYI (and IMHO), unless a frame is absolutely unrideable or trashed, beware of stripping and repainting a classic frame. It makes it prettier to look at for a little while but it wrecks the collector's value. Repaints kill the value of a frame. Do you want wall art or a "rider"? having slept on it, I then proceeded to overwhelm poor Tom with more of my "thinking"
Peter, thanks again. Your response was not long ... I appreciated all the detail. To answer your question about the Marioni, you're right, the price is $1,350 for a stock version of the frame set and $1,525 for a custom version. If I were to get it, I would probably be fine with the base component set, which is Camp veloce ($2,600), which I understand is equivalent to 105. But you gave me a lot to think about. Can I ask why you recommended the Ridley? Do you feel it's a particularly good value for the money? (the componenents don't seem to be lower end). Also, how old are your Times bikes? I suggested you look at Ridley because they are being carried by MEC and I turn to MEC as my base line for ethical (both in terms of commerce and in terms of society) retailing. They charge better-than-fair prices and have great return and warranty policies. so basically, I was suggesting you look at MEC. Unfortunately for bike retailers (unlike mattress retailers where you cannot compare models apples-to-apples because there are no standard models) 105 is 105, Ultegra is Ultegra, no matter who sells it. You just slap them on a frame with a pair of wheels. And that is about 50% the value of a bike. AND since it has 105 or Ultegra on it (and not the WARNING! Sora or Tiagra), that becomes (in my mind) the benchmark for shopping for anything. Bianchi can paint their frames "celeste" green (which forever was their marker of their top quality frames - their Japanese stuff was never painted Celeste. Red, brown, other, but never Celeste.) but that doesn't make it a great frame or a great bike. at a certain point it is just cosmetics. the MEC Ridely Fenix carbon bike (basically the same with maybe slightly better wheels -- indeed they are better, Fulcrum Racing 5) in Ultegra is $2850. So, there's your jump. 105 to Ultegra at MEC = $650. at any other retailer it would be a $1000 jump. So there's your $1000 leap. So, yes, while I would not want to show up on a MEC branded bike (which is completely irrational but that's the way we sorry consumers are) I would be happy to show up on a well equipped Ridley. So, yes, they are good value and a decent ego shot. Interesting about MEC and brands. 5 years ago their bikes were all branded "MEC" and probably came out of the same Aisan factories as many well-known international brands. (you can buy a very good carbon frame from China on line for about $350, a similar frame from say Pinarello costs $6000. Go figure.) but I think they eventually realised that people DO (unfortunately) value brands and MEC was perceived as "cheap". So, they first changed dumped the MEC label and changed the name to "Ghost". But when (I am speculating) the public couldn't find any mention or reviews of Ghost brand bikes online, they then cut the deal to retail the Ridley line. Similarly with clothing (at least bike clothing.) I always send people to MEC for stuff because Hey, inner tubes are basically the same, and if I can pay $2 or $4 at MEC instead of $5 to $10 at a real bike store, I'm OK with that. They similarly have excellent prices on all the other basics, like cables, computers, tools, etc. And you don't get confused by the flurry of brands and models. They usually only have one choice, maybe two, but it's a well chosen choice. But we used to think of MEC as "cheap". their bike clothing was again MEC-branded (and was fine). But they didn't have the chic brands like Rapha or Assos. But when I stopped in the store this week I saw that they were now carrying Castelli, which for years, decades, was THE name in cycling clothing. So there. Though I must say, at least whomever you were speaking to about the Bianchi didn't push you into a more expensive bike. Who knows? Maybe their margins are better on the lower end gear. Though I must say too that a 53 cm frame seems a bit small. But who knows. But then I would never buy a new bike. They depreciate just like cars. probably 50% as soon as you roll them out of the store. Which brings us to the Times. These are about year 2010. They were trade ins at a local bike shop in France. They are superb machines, the top of the Time line. But just the components are worth considering. Campagnolo Record will perform and feel better than 105. And a $500 premium over Dura Ace. and that is from a well known online shop called Competitive Cyclist, where the pricing is very very aggressive. In a local store the spreads would be higher. Competitive Cyclist is a pretty good place for competitive shopping, or at least checking prices. You can see the cost differential of different components, different wheels in the online Build system. There you go. that's about all I know I think. Oh, but if you wanted to think about steel alternatives to the Marinoni, here's a couple that I have. But if (or when) you have time, you should come over and jump on a few different sized frames, at least to test out the appropriate frame size. Had an inquiry via this website the other day (Yea!) and the response got so involved that I thought it would be worth posting here, as it captures much of my thinking about buying a bike. 2. Bianchi Intenso 105 (http://www.bianchicanada.com/intenso105c.html). Bike shops are steering me towards carbon. I'm not going to be racing, but I would like to be able to keep up if I start riding in groups and the bike shops and other friends with carbon bikes are telling me that riding steel will make it tough to keep up (If I understand correctly, the real advantage of carbon is the stiffness not the lower weight, but I"m not sure). 3. Buy the Bianchi and then take my time finding a nice vintage steel bike, hopefully through you. So basically I'm struggling with a) the carbon vs. steel decision. And b) if I go steel, I thought it would be nice to get a brand new steel bike that might become a nice, classic vintage bike someday. Would the Marinoni be a good choice? Or would you be able to help find me a better vintage bike? (Buying both the Bianchi and the Marinoni would be more that what I was planning to spend at this time.) I really enjoyed reading your website, and would appreciate your opinion. I heard the Marinoni 40th frame mentioned the other day, during my wednesday AM group ride. I don't know much about Marinoni either. well, that is to say I know all about them as one of the prestige Canadian frame builders, and a member of our vintage bike club is an absolute fanatic for Marinonis. But I've never owned one. It looks like a beautiful bike. and I am sure it is. 1. Marinoni is revered in Canada, but is virtually unknown elsewhere. That doesn't diminish it's value. thats just a fact. though if you never plan on selling the bike, it's value to anyone else is irrelevant. common. You see them locked up on the street everywhere. But I expect there were ranges of Marinonis - Top, upper and middle (there were probably no low end Marinonis). You can get a good condition used Pinarello or Colnago or other prestige Italian brand frameset for ... $500 to $700. So, is a Marinoni worth $1400? Hmmm, this is a long story. But I may as well write up my thoughts for future reference. The place bike dealers save money is in the wheels. and the wheels are the one place you want to invest. I cannot find a weight reference but I expect these Fulcrum Racing Sport wheels are relatively heavy. (I'll ask La Bicicletta and I have emailed Fulcrum directly.) If they are over 2000 grams, then they are cheap wheels that will hold you back. and when you are talking about a carbon bike in the 7500 to 8500g range, that 300 g makes a difference. Bianchi for years has slowly debased their name. for decades they have had low end Japanese made bikes out there. Perfectly fine bikes, just not really a prestige bike. That said, a lower end bike will function perfectly well. The other problem with the Bianchi is that the resale value will be low. For one, because people will know that the Intenso it is not a prestige Bianchi model. And 2, because people will be confused with all the thousands of Bianchis out there and so will not ascribe as much value to the brand name. Otherwise, if you are still thinking carbon (and I kind of understand. I feel a bit silly and old fashioned showing up on vintage steel on group rides where everyone else is on the latest and greatest carbon) You might look at the Ridley's at MEC. Or, if one of these fits, you should consider one of my Times. These VXRS models ARE the top of the line from Time, what the pros actually ride. and wIth top top end Campagnolo Record and excellent, lightweight wheels, at $2950 they are incredible machines that would be $6000-7000 at la Bicicletta. What size frame to you ride or think you need? that would focus the discussions. A woman contacted me the other day asking whether the hybrid bike a friend had loaned her woudl get her through a 2 day charity ride, or whether she should upgrade to a real road bike (as her local bike shop had suggested.) She told me that it was "too easy" on the flats. It got me thinking about how to Talk Bikes with a true novice, what they need to know. Here's how I answered Shirley. Let's talk about what style of bike you need/want. There are three main aspects to a road bike. As regards gears and components. Re: that bike your friend loaned you. Is it a road bike? or a hybrid or a mountain bike? can you shoot me a picture of it? Assuming it is a reasonably lightweight road bike, are there 2 rings on the front (near the pedals) and 7 on the back wheel? If so, then 2x7=14 should be adequate for most riders. Of my personal collection of bikes I have 2 with 2x6, and several with 2x8. And 2x8 is more than I generally need. the key is having a gear ratio that is low enough (i.e. easy enough) to allow you to get up any hills you might encounter. of your current bike doesn't make it reasonable to get up a hill, then Yes, there is a problem. Wheels and tires. if you have very heavy wheels and fat or knobby tires, you will go more slowly (by a good % - I would say up to 25%) and you will have more trouble getting up hills. And the bike will feel sluggish. The Frame. no need to talk about frames until I better understand what you are comparing to. but a clunky old frame that weighs a ton (over 12 kgs) is also going to slow you down, feel sluggish and make climbing hard. So, get back to me on those points will you? photo. is it a road bike? and is it a 2x7 setup? I am attaching the pics but it looks as if I have a lightweight 2x7 road bike. Maybe I don't need a new bike but the people at [ the bike shop] felt I needed more gears among other things. I haven't really done a lot of hills so I haven't encountered any trouble there but when I am on a flat stretch, I seem to be limited to a certain speed because my legs just spin without any tension...if that makes sense. I thought I could use a lower gear. I would respectfully suggest that Sporting Life (like all bike shops) is in the business of selling bikes, not trying to get people to keep their old bike. Your comment about spinning out on the flats is perfectly reasonable. I expect that is simply because you have not figured out (again, with respect) the correct gear combination (called Gear Ratio, let's call it GR). GR is measured in Inches, how far you would travel with one pedal rotation in a certain combination of front + back. Your spinning out suggests you are in too Low a GR for the flats. It's all a question of very simple math. Not even math. Just counting the number of teeth on the front and back rings and sprockets. You need a Low gear to climb a hill easily. the Lowest gear ratio is when you are in the small front ring and the largest rear sprocket. I can climb most hills with a 42 teeth front and a 25 teeth rear. To go flat or especially to go downhill without spinning out you need a High GR. So that is a Range of 42inches to 114inches. A less fit or experienced cyclist might need a Lower low to get up hills. If I had a 34 front and a 30 rear (like a Mountain bike) that would give me a 30inch low and make the hills much much easier. it may simply be so old and so out of tune that it doesn't shift easily and so you haven't bothered. so you may be down to a functional 3 speed if the shifting is really stiff. All that said, it would not be the most pleasant experience. That is, I think (Only "think" because I cannot see any details in the photo), a relatively cheap bike probably with relatively low end components. Probably heavy (do you have a bathroom scale? weigh yourself and then you holding the bike. What's the difference. If it's more than 12kgs / 27.5lbs, then it is not lightweight and so is probably not well constructed.)) You cannot as they say make a silk purse out of a sow's ear. It won't feel great. the shifting will always be clunky. It will be hard to tune. It will brake erratically.....And people will look at you and wonder "What is she doing on THAT bike?" So you would need a strong ego. I am sorry to be so blunt, but this is the reality. Another possible problem might be if it is the wrong size. If you cannot set the saddle to a comfortable position. If you have the patience to do more measuring, measure the distance from the middle of the Bottom Bracket shell (the big tube that the crank axle passes through) to the top of the saddle, along the seat tube. But there is nothing that completely disqualifies that bike. But, if you want to do more than a one weekend ride and if you want that ride to the cancer ride more enjoyably, you might consider a different bike. I have one, a very nice one, that I would suggest you try. You are welcome to come by and we can test it out. I will set you up, show you have the shifting works and see how you look size and fitwise. You can even borrow it for a weekend. Whether you like it or not, there is no obligation. You will at least feel the difference between a good bike and a poor quality one. In the end, when she did come over, it turned out her loaner hybrid was a 3x7 setup (perfectly adequate), the wheels and tires were reasonably slick (and about 30mm wide so not TOOOO wide) and it weighed a bout 12.5kg / 27.5lbs. (not grotesquely heavy). Peter Stock, bike tour designer, cyclist and amateur road bike collector/dealer. Learning as he goes.